Just a quick post to celebrate the return of Great British Bake Off tomorrow! Yippee! More delicious cakes, fancy bakes, and almost certainly a few soggy bottoms. 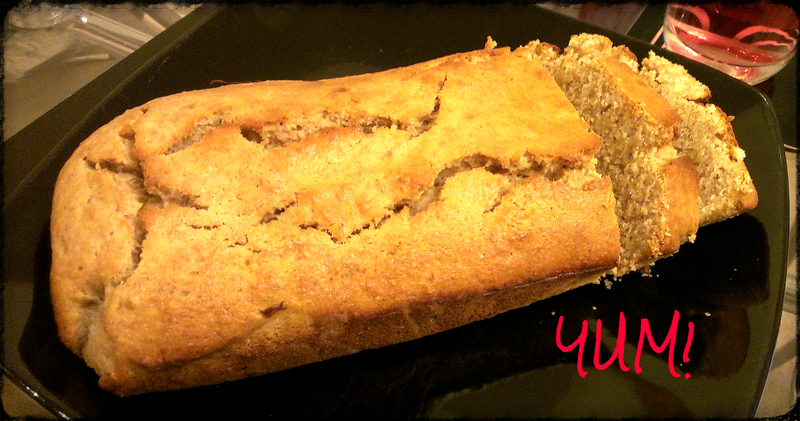 This is a banana bread I made a couple of days ago after being stared down by two overripe, underwhelming yellow fruits. I adore bananas, but when they are past it I cannot STAND the smell of them. So, instead of force feeding Olly with them (which happens quite often), I found a simple but terribly unhealthy recipe of butter, sugar, mashed bananas, vanilla extract, an egg, self raising flour, and voila! Banana bread is born. It tastes so good, it would probably see me through to the Bake Off final. Ok, maybe not. But it has certainly gone down extremely well with Olly, who is looking at me right now, with crumbs down his front… Busted.